At the diminutive height of 5 feet 2 inches tall, Mitzi Shore cast a giant shadow across the comedic landscape of L.A. She was the woman behind the premiere comedy club in America– The Comedy Store. But it was her distinctive voice, widely mimicked by comics that overshadowed her tiny size. Once described by the L.A Times as “the wiry voice of a nagging mother” it was a high pitched, nasally inflected whine that was mellifluously sweet when she liked you and stridently shrill when she didn’t. That voice is now stilled with her passing earlier this year after a long and heroic battle with Parkinson's disease. She leaves an indelible mark on the stand-up community since first opening the club in l972 with her then husband, Sammy Shore. Two years and a divorce later she became the club’s sole owner as part of their divorce settlement. Now unhampered by joint custody of her baby, she nursed it; rehearsed it and transformed it into a palatial joke emporium. 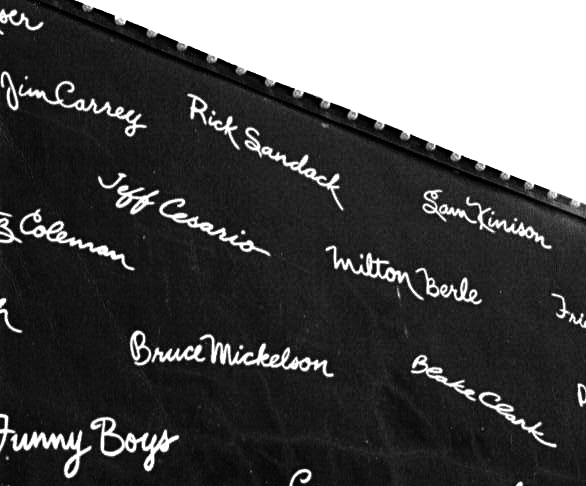 One look at the names inscribed on the The Comedy Store’s exterior walls pretty much sums up the magnitude of Shore’s legacy. From superstar comics including Richard Pryor and Jay Leno to unknown comics who found their unique comedic voice, the club was and still is the launching pad for countless comics who have honed their craft in these rooms and I was fortunate enough to be one of them. Pointing to Robin Williams inscribed moniker, she explained how his mind blowing, improvisational genius was quickly tapped by TV mogul Gary Marshall to play Mork on Mork and Mindy. But it was Mork and Mitzi before that, as instrumental in Robin’s meteoric rise to stardom as she was to scores of comics who credit the Store as their launching pad to fame. Jim Carrey tweeted: “She opened the door to my life and I will love her forever”. And so for the next three weeks, when I wasn’t honing my act in the lesser rooms where it didn’t matter if you bombed, I planted myself at the club and watched a parade of the then-unknown comics, including Arsenio Hall, Gary Shandling, Dennis Miller, Larry Scarano, Byron Allen, Andrew Clay before he added “Dice” and got lucky, and a caged maniac named Sam Kinison whose gut wrenching, primal scream punctuated a comic diatribe that lit up the room like a pinball machine. That was the night Mitzi finally hired him as a ‘paid regular’ and he was so ecstatic that he kissed her right on the mouth, knocking over her table and spilling her Coke. Afterwards she suggested that I write about Sam in my story. “Guy who spilled Coke,” she wrote in my notebook and I did, too, profiling him as the scene stealing star that dwarfed the competition. Spotted: Rick Sandack's name on The Comedy Club's 'Wall of Stars" and pictured (right) inside the venue with comedian Pauly Shore. Two weeks later, on the night of my big audition, I revised my prayer from “God I hope I’m funny” to "God, I hope I don’t follow Sam Kinison.” But it was Mitzi Shore who answered my prayer when I finally went on at 11 p.m, placing me three acts after Kinison when the audience had recovered and I scored. When they gave me the light signaling that my time was up, she invited me to join the lineup as a ‘paid regular’. It was a pinnacle moment that became a pivotal turning point in my life and a personal validation from the “The Godmother of Comedy”. That’s what Robin Williams named her way back when and it’s stuck ever since. 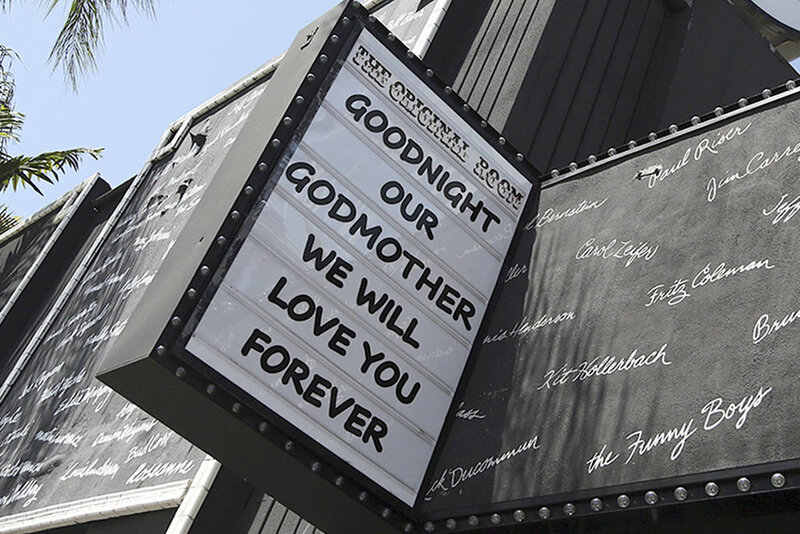 At her memorial this past Mother’s Day, held in the club’s 350 seat Main Room, comedians, former waitresses, friends, family and even other comedy club owners came out in droves to pay their respects. It was a fitting finale featuring heartfelt tributes from Jimmy Walker, Louie Anderson, Bob Saget, Andrew “Dice” Clay, Pauly Shore and her onetime boyfriend/longtime comic, Argus Hamilton who put it best when he said: “She saw a special light in each of us and gave us a chance to develop so that we might share that light with the world”. She was formidable, tough and loving. Part Glinda, the Good Witch of the South, and part Elphaba, the Wicked Witch of the West: a female Wizard of Oz whose domain was the yellow brick road for countless comics who found their own unique voices in the hallowed halls of The Comedy Store. RIP Mitzi Shore and thanks for giving us the light.